Surveying the surveillants through 16th-20th century prints, books, photos, and objects reveals an arms race of observation and evasion. Early surveillance photos from U.S. banks (1950-1980) show thieves evolving disguises: Hands over faces turn into masks, gloves, and a hunky robber working under a floppy hat and dress. Cameras themselves morph from clunky apparatus into a lighter (c. 1960), cigarette packet (c. 1970), and handbag (c. 1975). This historical survey also emphasizes surveillance as something people, not reified deities or states, do. Recovered Stasi file fragments show women frolicking by the sea, implying voyeurism. Playful, colorful copper engravings from 1798 and 1800 show sleeping watchmen. 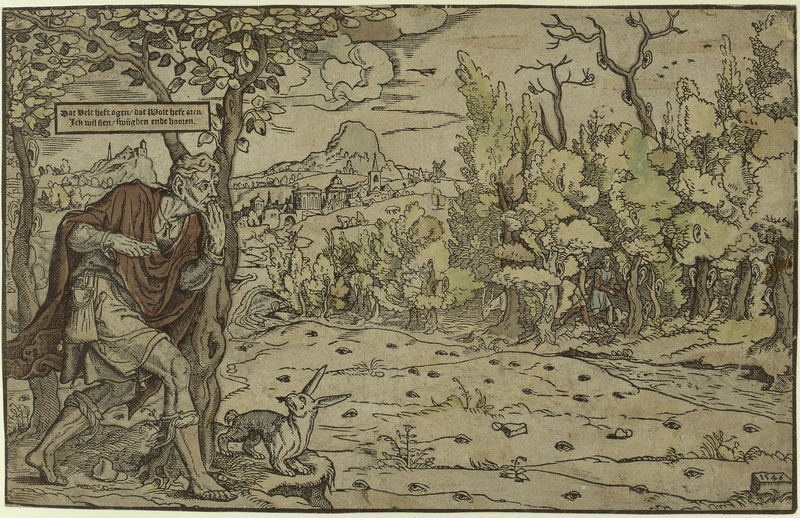 In another engraving, The Field has Eyes, the Forest has Ears, (1546), one man listens to two others in the forest across the field. Its message: we are each others' keepers. To paraphrase Jean-Paul Sartre, tyranny is other people.